The Gnomon or the style is the shadow casting component that will be found in one form or another on all sundials. The main feature of the gnomon is the angle at which it is set – the sketch below is of a typical plate dial known as a horizontal sundial. 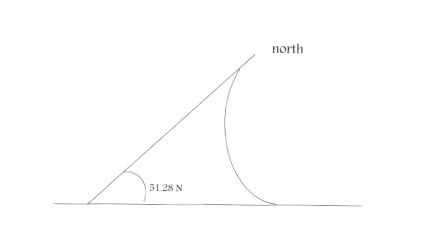 The angle of the gnomon corresponds to the latitude at which the sundial is sited. For example if the sundial was to be sited at Greenwhich London that has a position of latitude of 51.28 degrees N, the gnomon would be angled correspondingly. With this angle at this location the angled edage of the gnomon runs parallel to the earth’s axis.